acquired Can-Am Mailbox Rentals in Niagara Falls, NY. A logical vertical extension of the Speed Global Services suite of logistics offerings, SGS Can-Am Mailboxes was born. Unlike the traditional post office, SGS customers can not only send and receive mail and packages via USPS, but can also utilize FedEx, UPS, and all other delivery services. SGS Can-Am Mailboxes also enables Canadian-based individuals, small businesses, and large corporations to establish U.S.-based mailing addresses called “suites.” These suites not only enhance the image of businesses by giving them an international presence, they allow customers to realize significant savings in delivery time, customs charges, and international delivery shipping costs. 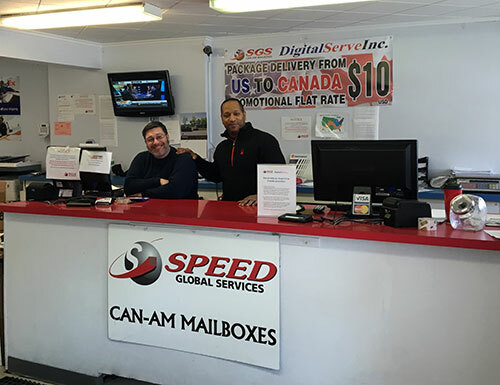 By expanding into the business-to-consumer market, Speed Global Services is making it easier for Canadian citizens to take advantage of free and reduced-cost shipping options offered only to U.S. mailing addresses from major retailers such as Amazon.com, eBay, QVC, HSN, TireRack.com, HockeyMonkey.com,Overstock.com, Zappos.com, and virtually every other Internet retailer. In the business-to-business segment, SGS Can-Am Mailboxes provides Canadian-based businesses with the ability to obtain a U. S. mailing address without opening a physical location in the United States. This not only provides the same shipping cost savings realized by Canadian citizens, but also enables businesses to immediately assume an international presence.